The GEL model range offer best deep cycle durability and overall longer life. The use of high purity materials and lead calcium grids ensure that for both AGM and GEL products have particulary low self discharge so that they will not go flat during long periods without charge. Both ranges are supplied with M8 drilled, flat copper terminals ensuring best possible connection contact and eliminating the need for battery terminals. The batteries are compliant with both CE and UL specifications in ABS fireproof containers and come with Victron’s 2 year world-wide warranty. Design life: >20 years at 20ºC, >10 years at 30ºC, >5 years at 40ºC. Under normal operating conditions and 20ºC, distilled water has to be added every 2 – 3 years. 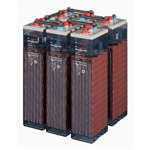 The batteries are available filled with electrolyte or dry-charged (for long term stocking, container transport or air transport). 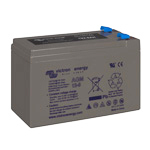 Dry charged batteries have to be filled with diluted sulphuric acid (density 1,24kg/l @ 20ºC). The electrolyte may be stronger for cold- or weaker for hot climates.